Hi, Lori here welcoming you to another episode of Real English Conversations from BetterAtEnglish.com. Today’s conversation is about some of the differences between American and British English usage when it comes to telling time. This conversation also marks the first appearance of my very own mom here on [email protected] She give us her perspective on American usage, while my English friend Michael (whom you know from earlier podcasts) returns this episode to cover the British point of view. This episode follows directly from the previous episode, number 44, so if this is your first time listening to our podcasts you should listen to episode 44 first. 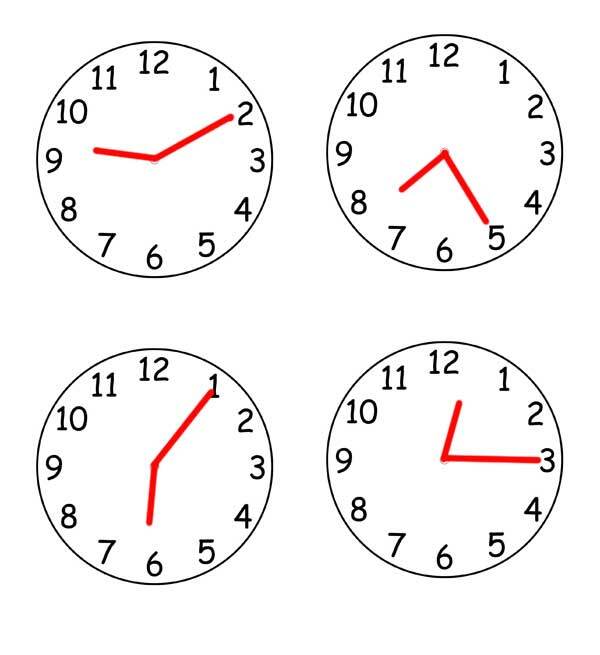 Mom:	OK, well starting on the top left I have ten m minutes after nine, and then the next one to the right is twenty-five after seven, and then on the bottom left is five past six and the last one on the bottom right is a quarter past twelve. Mom:	Yeah, I think one time I said past..I think I said five past six. In fact I purposely said past because I was trying to give you some variety of the difference…we can tell time…because Americans will say past. Lori:	Yeah! That’s what I think as well, that I…maybe naturally I’d be more likely to say after but I wouldn’t think it was weird or strange if someone said past. Mom:	No…no, that’s exactly…’cause…I think the first couple of times I said after and then I thought, “Oh I’m going to give her a little variety,” so I’ll say five past six because we do say that, but it’s…I mean we wouldn’t think it’s odd. Mom:	In fact I think we especially do it with with…on the half hour, we say half past twelve. Lori:	Right, right, half past twelve, definitely. Yeah, you wouldn’t say half after twelve. Mom:	Exactly, ’cause that’s what you see on a digital clock. Lori:	So anyway, that was my little experiment! Lori:	…and read the times that you see on the clocks. Michael:	Yeah, it’s ten past nine… that’s from the top left. 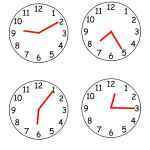 The top right is twenty-five past seven. The bottom left..err..five past six, and the bottom right one is quarter past twelve. Lori:	OK, cool! You’ve also scored 100%. You can tell time on an analog clock! Michael:	It’s true as well, it’s..in fact, I can tell you that…I mean she’s absolutely right. I mean, never mind the experimenting, that is how we are taught. And I’ve never heard anybody say ten after, you know, three or something like that until I met an American person. Lori:	OK! OK, but did you still understand it the first time you heard…did it cause any problems? Michael:	Oh it didn’t cause any any confusion… you say 10, you know five past, ten past quarter past, twenty past, twenty-five past. Michael:	But I’ve heard some American people say ten till..
Lori:	Oh yeah, ten till six, yeah quarter till, um-hmm. Michael:	You never ever ever ever ever say that in British English, it’s always past and it’s to and it’s drummed into you. Lori:	OK, that’s quite interesting. Michael:	Being deliberately obtuse if you’re going, “Huh? I don’t get it.” You know, because it’s obvious to anyone with half a brain, you know, what it means. But it is…it stands out as being unusual ’cause this is… yet we have this little clocks with the, you know, the movable hands. Michael:	Nine ten…yeah. But I don’t…I don’t say times like that anyway. I always do it the old-fashioned way. even after the advent of digital things because my dad would belt me if I said it, err, you know, the digital way, I’d… seriously, I’d get in trouble when my parents would yell at me. Lori:	Oh, that’s funny why, why…Did they ever say why they didn’t like it? Michael:	Yes, they felt it was dumbing things down, err, and it meant that you know you wouldn’t be learning you wouldn’t know how to tell the time properly. Err, because if you just read it out like that…err…and…I mean I think they had a very good point, because if you, you know, if you only knew how to tell the time like that and then you were at, oh I don’t know, some big train station somewhere where they had an analog clock and you’re going, “Oh, umm, let me work out bla bla bla,” you know, it’s…it’s not so good. Lori:	Yeah, it’s definitely, I think, everyone needs to know how to tell time on an analog clock but I wouldn’t go so far as to force people to use that every time they were talking about time because I think the digital system is so established now and it really makes perfect sense. Michael:	But anyway… I love them but they’re…you know…misguided in the extreme. Lori:	You know I’m going to have to bleep you out now. Lori:	We’re not recording for Uncensored English! That’s all for this time. Of course, in these spontaneous conversations we can’t cover all of the usage issues that apply, and sometimes the examples we come up with on the spot might not be the best from a teaching perspective. So to make up for that I’ve added some extra usage notes to the pdf file for this episode. I hope you find them useful. Thanks for listening, and bye for now! See the PDF for the Vocabulary list and usage notes.